• Freshwater (FW) pond and lake ecosystems are open water bodies with water depths greater than 2 metres and little to no floating vegetation. The difference between a pond and a lake is size: ponds are smaller than 50 hectares, and lakes are bigger than 50 hectares. 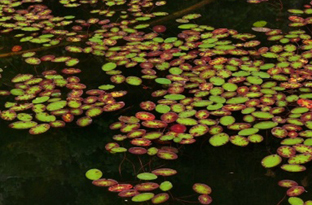 • Freshwater ponds and lakes are influenced by groundwater, precipitation, stream flow and evaporation. • They often form complex inter-relationships with the linear riparian ecosystems along their shorelines, as well as with wetland ecosystems that are nearby. DIEM has mapped Freshwater Ecosystems light blue in the Sensitive Ecosystems Mapping. 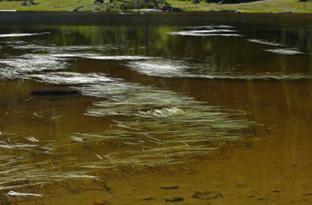 Open freshwater ecosystems include both ponds and lakes. 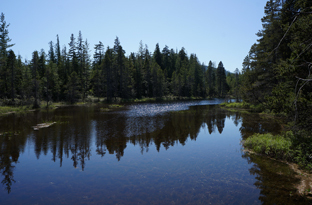 A pond or lake ecosystem consists of four distinct habitats: shore, surface film, open water, and bottom water. Each provides conditions that support different kinds of organisms with specific adaptations. There is considerable variability in the available habitats. For example, bottom water conditions are variable as they are greatly influenced by substrate and depth. Shallow sandy bottoms provide a nesting environment for earthworms, snails, and insects, while the more muddy conditions of deep bottom water supports flatworms, rat-tailed maggots, and dragonfly nymphs. All open freshwater ecosystems provide critical breeding habitat for invertebrates, amphibians, and fish. These water bodies are also valuable habitat for many resident birds and also a stopover for migrating species. They are a rich source of nutrients for many aquatic and terrestrial species—and a vital source of drinking water for all! 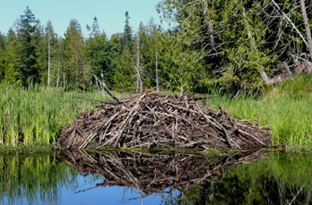 In the Discovery Islands, Beavers are often the cause of ponds. The iconic rodents are famous for building dams by felling trees with their strong teeth; and their lodges—partially submerged structures of branches and mud—can change fields and forests into the watery habitat in which they and many other species thrive. 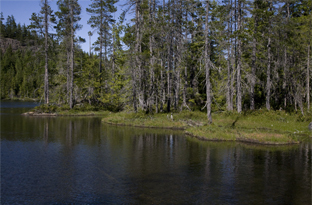 Ponds and lakes are found throughout the Discovery Islands in various terrains and at all elevations. For humans, the island lakes are popular destinations that offer opportunities for healthy recreation. WHEN YOU EXPLORE Ponds and Lakes, be careful not to disturb vegetation at the water’s edge – particularly between March and August, when birds are likely to be nesting there. FLORA Buckbean, cattail, clasping-leaved pondweed, common mare’s tail, floating-leaved pondweed, greater bladderwort, hard-stemmed bulrush (tule), narrow-leaved bur-reed, Sitka sedge, water lobelia, watershield, yellow pond-lily. Beaver lodges and bank dens under shorelines are also made. 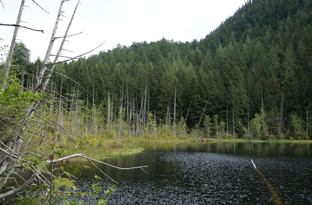 The shoreline logging by the beavers opens up water-shrub-forest edges for a variety of other species. 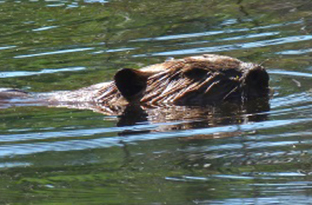 Throughout the Discovery Islands beavers are a keystone species of aquatic habitats. Shallow depressions with water inflows are dammed and productive wetlands, ponds and shallow lakes are created. 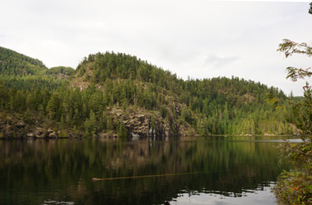 exist as both sea-run and freshwater types in coastal BC. Some go to sea and come back to freshwater, often estuaries for the winter. Others spend their entire life in small clean fresh water streams and pools. They spawn at 3 to 4 years and could live 10 years. 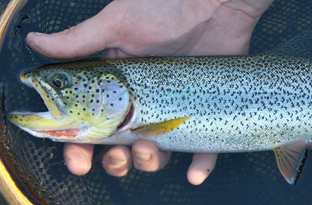 Cutthroat trout are so names as they often have an orange-red streak under the jaw. They used to be much more numerous but are now blue-listed in BC. 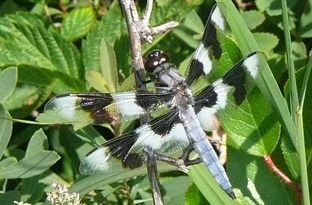 Eight-spotted skimmer wings have 2 dark patches on each wing, totalling 8. 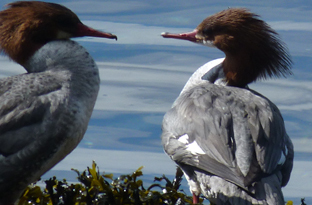 Mature males acquire a grey-blue coloration on body and wings Their habitat is usually marshy lakes and ponds. It’s attractive flowers with a bad smell are useful for attracting flies, beetles and bees for pollination. The three leaflet-leaves on long stalks are unmistakable and buckbean had a variety of medicinal uses including treating scurvy. 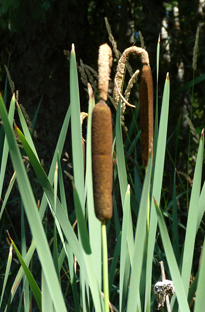 Tule or hard / soft – stemmed bulrush with their stout erect stems were very important in making baskets, roofing, mats and other items. 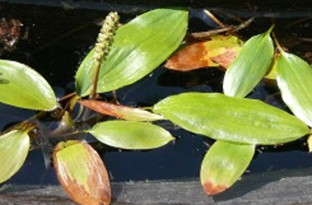 They grew in shallow water along the shores of lakes, marshes and estuaries. 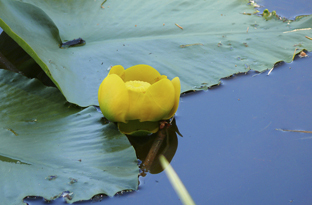 Yellow pond-lily grows from huge rhizomes on the bottom of ponds and shallow lakes. The floating leaves are great aquatic platforms for many birds and insects. It’s leathery oval leaves float on the surface, have a noticeable gelatinous surface and create lovely artistic colour patters from dark green to red. Emergent flowers are purplish. They are fairly large salamanders with unusually granular dry skin. They range from orange to dark brown above but are yellow to orange under their bodies, legs and feet. In spring they mate and “newt balls’ of several newts may be seem. 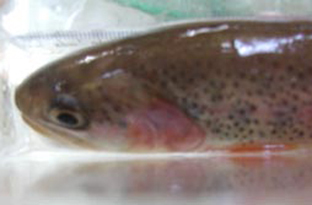 Eggs are laid in water attached singly to vegetation and larvae are gilled and live in water for 1 or 2 seasons. 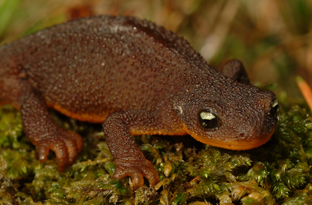 Newts are carnivores eating many invertebrates such as insects and slugs. Their skin is poisonous to many species but not to their main predator the common garter snake. 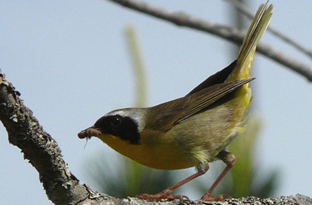 They are warblers of the wetlands, most often found around wet areas, nesting in low shrubs or other vegetation. Recognizable by the males’ “witchety whitchety witchety” call and when see, by the bright yellow breast and black Zorro mask. Lakes and ponds are found in various terrains and elevations throughout the Discovery Islands. 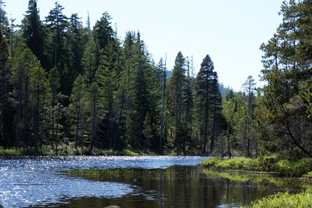 Quadra, West Redonda and Sonora have several large Freshwater ecosystems, while some of the other large islands, except East Redonda have a few.